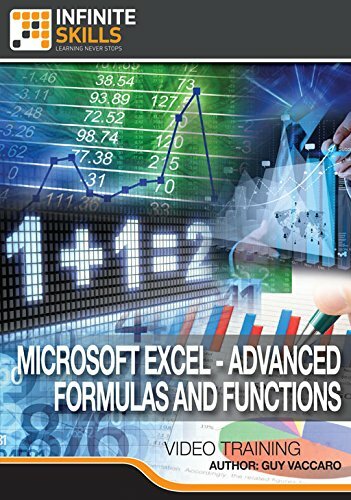 In this Microsoft Excel Advanced Formulas and Functions training course, expert author Guy Vaccaro takes you beyond the basics of Excel, and teaches you how to use the advanced formulas and functions in this spreadsheet program by Microsoft. This course is designed for users that already have a basic working knowledge of Excel. You will begin by reviewing the basic operations, such as sum and count syntax, function processing order, and knowing the troubleshooting tools. You will explore extended formula usage with 3D referencing, naming cells and absolute referencing. Guy proceeds to instruct you on how to look up and reference type functions using VLookup and HLookup. Other features that are covered in this computer based training include; generating random numbers and values, locating data using text functions, and learning to use an array formula to count unique entries. By the completion of this training course, you will be comfortable with using many of the advanced formulas and functions that this powerful spreadsheet software from Microsoft offers. Working files are included, allowing you to follow along with the author throughout the lessons. Learn Learning Microsoft Excel - Advanced Formulas And Functions from a professional trainer on your own time at your own desk. This visual training method offers users increased retention and accelerated learning.